Economical enough to be used one time in high temperature applications, or where the cap will be used during shipping after coating process. Our EPDM Cap (EC) product line is the industry standard for low cost masking applications. 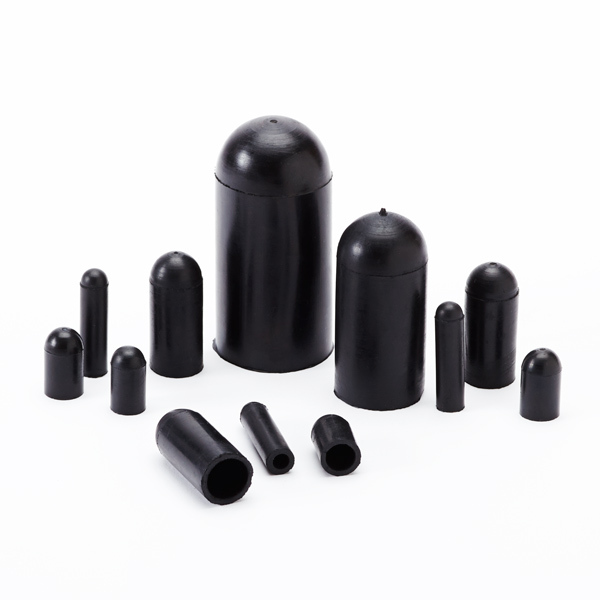 Their versatile nature allows them to fit over extrusions, threaded studs, PEMS and dowels, as well as be used as a plug for tapped holes, irregular contours and threaded holes. Our high temperature EPDM is specially formulated to resist chemical attack and ensure reusability and economy during masking. When sizing parts as a cap, the ID of the cap should be 2 - 3% smaller than the stud diameter. To ensure easy removal, select a cap length that is slightly longer than the masking length of the stud. This is especially important if the cap ID is less than 4% of the stud diameter. When sizing parts as a plug, the OD should be at least 6% larger than the hole diameter. 0.040 (1.0mm) ID X 0.130" (3." 0.062 (1.6mm) ID X 0.152" (3." 0.100 (2.5mm) ID X 0.200" (5." 0.109 (2.8mm) ID X 0.209" (5." 0.109 (2.8mm) ID X 0.229" (5." 0.125 (3.2mm) ID X 0.225" (5." 0.140 (3.6mm) ID X 0.260" (6." 0.148 (3.8mm) ID X 0.238" (6." 0.156 (4.0mm) ID X 0.276" (7." 0.172 (4.4mm) ID X 0.292" (7." 0.180 (4.6mm) ID X 0.270" (6." 0.187 (4.7mm) ID X 0.307" (7." 0.197 (5.0mm) ID X 0.317" (8." 0.218 (5.5mm) ID X 0.338" (8." 0.234 (5.9mm) ID X 0.354" (8." 0.250 (6.4mm) ID X 0.370" (9." 0.295 (7.5mm) ID X 0.415" (10"
0.312 (7.9mm) ID X 0.432" (10"
0.340 (8.6mm) ID X 0.460" (11"
0.355 (9.0mm) ID X 0.475" (12"
0.366 (9.3mm) ID X 0.486" (12"
0.375 (9.5mm) ID X 0.495" (12"
0.437 (11.1mm) ID X 0.557" (1"
0.456 (11.6mm) ID X 0.556" (1"
0.468 (11.9mm) ID X 0.588" (1"
0.500 (12.7mm) ID X 0.620" (1"
0.535 (13.6mm) ID X 0.635" (1"
0.535 (13.6mm) ID X 0.655" (1"
0.600 (15.2mm) ID X 0.708" (1"
0.625 (15.9mm) ID X 0.745" (1"
0.750 (19.1mm) ID X 0.870" (2"
0.812 (20.6mm) ID X 0.932" (2"
0.875 (22.2mm) ID X 0.995" (2"
1.000 (25.4mm) ID X 1.120" (2"
1.062 (27.0mm) ID X 1.182" (3"
1.125 (28.6mm) ID X 1.245" (3"
1.250 (30.1mm) ID X 1.370" (3"
1.500 (38.1mm) ID X 1.620" (4"
1.750 (44.5mm) ID X 1.870" (4"
2.000 (50.8mm) ID X 2.120" (5"
1.625 (41.3mm) ID X 1.745" (4"
1.875 (47.6mm) ID X 1.995" (5"